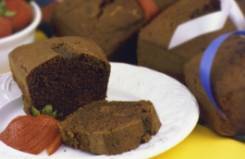 This pound cake combines three favorite flavors, almond, coffee, and chocolate! 1. Preheat oven to 325 degrees F (160 C). Grease and flour one (1) bundt pan or two (2) 4x8-inch or four (4) mini loaf pans* (see note below). 2. Whisk the cocoa powder into the hot coffee until dissolved. Stir in the milk and set aside to cool. 3. With an electric mixer, beat together the grated almond paste, sugar, and butter until light and fluffy. 4. Add the eggs one at a time, beating well between each egg. 5. Add the vanilla extract and beat until just blended. 6. In a separate bowl sift the flour together with the baking powder, baking soda, and cinnamon. 7. Beating on low speed, alternately add flour and cooled coffee mixture into the creamed ingredients until all mixed together. Increase speed to medium and mix for 2 minutes more. 8. Fill the pan(s) with batter. 9. If using a bunt pan, bake for 35 – 45 minutes or until a toothpick inserted 1” from edge of pan comes out clean. *Note: If using loaf pans, bake 45-55 minutes, or until toothpick comes out clean. If using mini loaf pans, bake 22-25 minutes or until toothpick comes out clean. Makes: 1 bundt cake or two 4" x 8" loaves, or 4 mini loaves.